Zuliganz (pronounced zoo•li•gans) is the name of Jenny Donaldson’s mischievous wheel-thrown clay creatures. Most begin as 3-footed wacky animals and are finished with textured papers to bring out their personality. 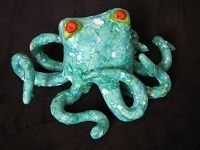 After many years of stacking and altering clay forms, Jenny began making these whimsical creatures. Looking for alternatives to glazing, she began experimenting with other options for the clay surface. Rich paper with lots of texture was the perfect fit. Looking for a little funktion in the Zuliganz form? These are made to serve. Some Zuliganz have been around for a while... and are working on their second lives (through the use of recycled materials). These Zuliganz clearly come from a different place. Let your imagination run. Make use of that vertical space. Zuliganz are also available on canvas wall tiles.